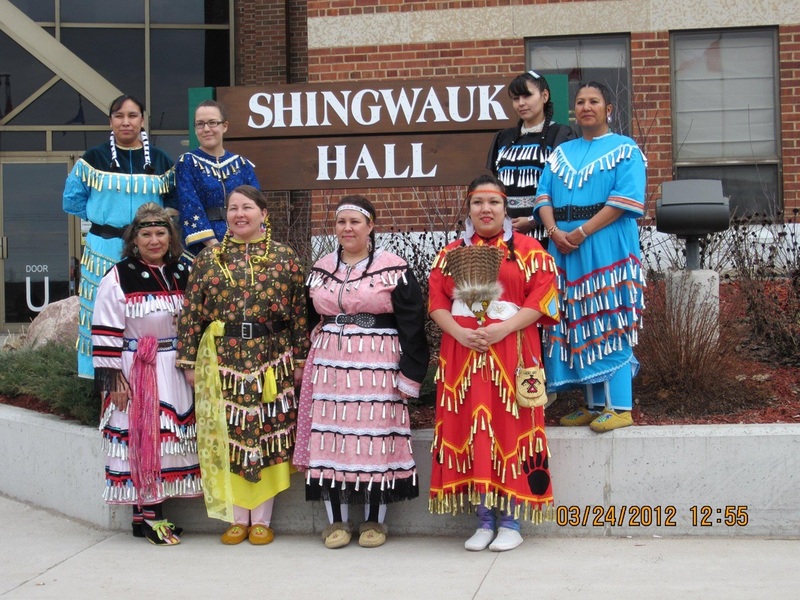 ‌Roxanne Martin is using her creativity and education to help preserve the Ojibwa language and culture. Martin will graduate from Algoma U this spring with a Bachelor of Fine Arts and a minor in Anishinaabemowin (Ojibwa Language). In 2012, she launched her own business, Baby WayNa Books written in Ojibwa. Martin, whose grandparents are from the Wikwemikong and Serpent River First Nations, says her business was inspired by her son Carter Joe, age four. Baby WayNa Ojibwa language books are for newborn- to five-year-old children. They feature basic Ojibwa words and incorporate materials such as soft fabrics and sensory images to enhance the learning experience. The name “WayNa” is one of the many ways to spell “Wenabozho”, the benevolent cultural hero of the Anishinaabe tribes (sometimes referred to as a "transformer" by folklorists). Martin also wants to create a business where local women can come together to collaborate and create various layouts/designs that would incorporate traditional thoughts and ideas into these books. She would like to have an open public story time once or twice a week. Her vision is to make Baby WayNa available in all educational institutions, book stores and local libraries. Martin says that Algoma U has helped her develop the skills needed to her reach her full potential. Martin says she especially enjoyed the Advanced Studio courses and the Anthropology class with Dr. Deborah Woodman. She says she learned a lot about different cultural perspectives and was inspired by Woodman’s enthusiasm and appreciation of her students. Martin also received a lot of encouragement from instructor Eddie Benton-Benai in her Anishinaabemowin classes. “I was inspired to create children’s books after doing many research papers in his class and finding out there is a major lack of resources for beginners to learn the Ojibwa language. 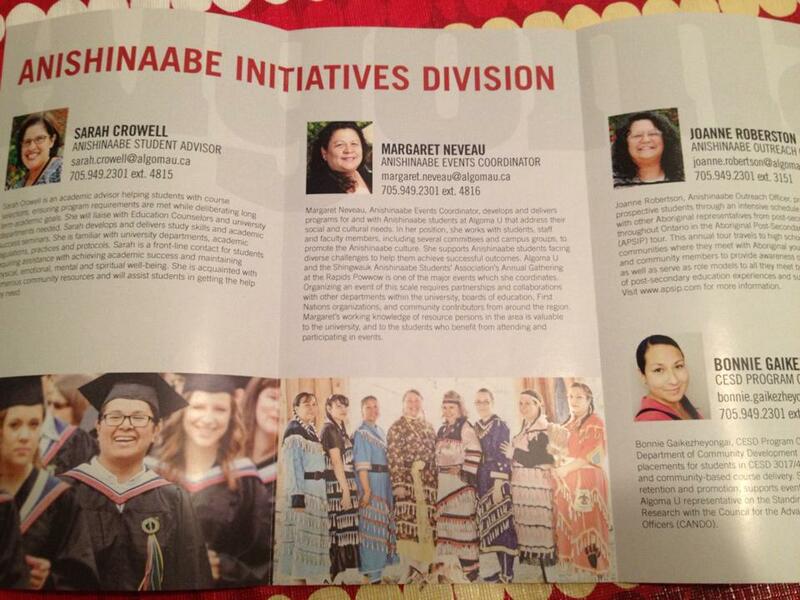 Martin has received many awards for her achievements, including the Margaret and Wallace McCain Family Foundation and Lawson Award from the Ashoka Changemakers for inspiring approaches to First Nations, Inuit and Metis Learning in 2012. 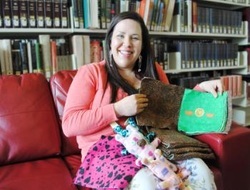 Her small business idea for Baby WayNa Books was selected as the winner out of 300 applicants. Martin was also chosen to attend a change makers conference gathering in Gatineau, Quebec. Martin has applied for fall entry into the Bachelor of Education program at Nipissing University in North Bay. In the meantime, she plans to focus on creating as many baby books as possible. For more information on Baby WayNa books, visit the Baby WayNa Facebook page or Martin’s website. Roxanne Martin’s artwork, titled "Round dance on parliament hill", was recently selected as one of six finalist pieces from across Canada for the National Youth Solidarity Project, a nation-wide competition. Her artwork will be on display in a special World Pride exhibition at the Art Gallery of Ontario. The competition is now open to public voting. The public can vote online for the competition winner, who will be announced on June 22, 2014 at the Youth Solidarity Forum in Toronto. The winner will mount their creation on a special Solidarity Wall in the Grange Park area, with the help of a seasoned street artist. Her artwork can be viewed online here. Please note, to fully complete your vote, you must verify with an email address. After you have voted, please check your inbox or spam/junk mail to click the vote confirmation email. This is quite an impressive accomplishment, and we encourage everyone to vote for Martin and show your support for her incredible achievement. Congratulations Martin and best of luck! Local artist Roxanne Martin is a finalist in the 4th Wall Youth Solidarity Project, partnered with The Michaëlle Jean Foundation. Martin's painting (pictured below) is one of six works that are being voted on to determine a winner. 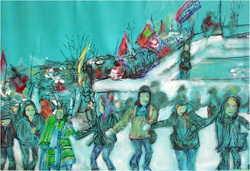 The painting is entitled Round Dance on Parliament Hill and it was done using the mediums fabric, acrylic and Sharpie. "I have many friends that are into the political side of the Idle No More movement and achieve great awareness across the country by speaking up against the government and the effects of Bill C-45 that are slowly stripping our Mother Earth. "I, on the other hand, have no political background but through these images taking from that day, I feel in love with my people even more and decided I needed to paint what I felt was the rhythm and movement of my people, I am an artist and goddaughter/great niece to the late Cecil Youngfox. "He was a well-known Anishinaabe Canadian painter and a homosexual man. He died from AIDS in 1987 but him and his partner Alberto Decastro made a huge, positive impact in the gay community of Toronto. "He truly is my spiritual mentor guiding me in the right decisions of creative thinking and having the ability to tell a story by expressing my spiritual instincts and painting them on fabric without any hesitations." To vote for Roxanne's painting click here. Note: you also have to return to your email to confirm your vote! A news release issued by The Michaëlle Jean Foundation can be found below. TORONTO - The Michaëlle Jean Foundation and the Art Gallery of Ontario (AGO) are delighted to announce the six young artists who will be featured in a groundbreaking exhibition marking WorldPride 2014 Toronto. On view at the AGO between June 22 and November 15, 2014, the Youth Solidarity Exhibition will inspire Canadians to work together to promote safe, inclusive and healthy communities for Two-Spirited and LGBTTIQQ youth throughout the country. 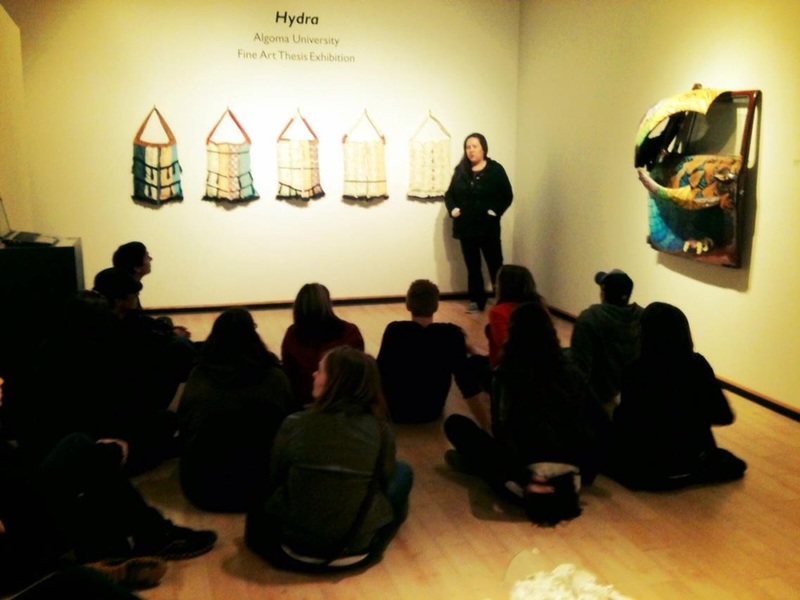 Each young artist will receive $1,000 CAD and travel to Toronto to view the exhibition during a Youth Solidarity Forum to be held at the AGO on June 22, 2014. The online vote here opened on May 16, 2014. Roxanne Martin is an Anishinaabe/textile artist, children's book designer, jingle dress dancer and an educational facilitator. A graduate from the Fine Arts, Anishinaabemowin programs, she inspires her community work with visual interpretations, storytelling and oral history of our surrounding lands and waters. An entrepreneur, she runs a small business for Ojibwamoowin children's books. As an Ashoka Change maker, Roxanne is currently fulfilling her commitment this fall to becoming a primary/junior teacher at Nipissing University. As an Anishinaabe community practitioner, artist and seamstress, Roxanne's artwork and her practices blend personal biography with humour, cultural belonging and social critiques to engage her viewers in social conversations. She is also the great-niece of Cecil Youngfox, a trailblazing Anishinaabe painter and gay rights activist. Brianne Walker, a 17-year-old human rights activist from Windsor, Ontario, and aspiring visual artist and filmmaker. The winner of the online poll will be announced at the Youth Solidarity Forum, awarded a $1,000 CAD prize and have the winning artwork transformed into a public outdoor mural. This project is actively supported by more than 55 human rights, faith-based, arts, newcomer, Aboriginal and health organizations across Canada. For a full list of project collaborators, please visit here. In theatre, the “fourth wall” is an imaginary screen that creates a virtual separation between actor and spectator. There are many ways to cross the fourth wall and to make the invisible visible. The Michaëlle Jean Foundation chose to do so through the 4th Wall: Make the Invisible Visible program, in collaboration with several prestigious Canadian museums and art galleries. The goal is to invite young creators to break down the invisible walls that create solitudes between individuals and communities across Canada, by opening the doors of our major cultural institutions to emerging creators from marginalized backgrounds. The Foundation offers museum and art gallery space and bursaries to youth from disadvantaged backgrounds, often cut off from museums, so that they can produce original art that conveys their experiences, ideas and challenges. On display for the public to see, their work provokes debate and builds solutions. The first 4th Wall exhibition was launched on February 5, 2014, at the Montreal Museum of Fine Arts, to mark Black History Month in collaboration with FRO Foundation. Through our programs, underprivileged youth are using their creativity to build new solutions to pressing social issues, like poverty, social exclusion and mental health. In so doing, they are catalyzing innovative community renewal projects, driving crucial Aboriginal cultural resurgence initiatives and kick-starting cutting-edge business ventures, all over the country. With a collection of more than 80,000 works of art, the Art Gallery of Ontario is among the most distinguished art museums in North America. From the vast body of Group of Seven and signature Canadian works to the African art gallery, from the cutting-edge contemporary art to Peter Paul Rubens’ masterpiece The Massacre of The Innocents, the AGO offers an incredible art experience with each visit. In 2002 Ken Thomson’s generous gift of 2,000 remarkable works of Canadian and European art inspired Transformation AGO, an innovative architectural expansion by world-renowned architect Frank Gehry that in 2008 resulted in one of the most critically acclaimed architectural achievements in North America. Highlights include Galleria Italia, a gleaming showcase of wood and glass running the length of an entire city block, and the often-photographed spiral staircase, beckoning visitors to explore. Visit ago.net to find out more about upcoming special exhibitions, to learn about eating and shopping at the AGO, to register for programs and to buy tickets or memberships. WorldPride 2014 Toronto (WP14TO) is an international celebration taking place from June 20 – 29, 2014, that incorporates activism, education, and the history and culture of global LGBTTIQQ2SA communities. WorldPride 2014 Toronto is presented by Pride Toronto, producer of Canada’s largest annual festival of LGBTTIQQ2SA culture and human rights, under license from InterPride. Pride Toronto is the not-for-profit organization that hosts the city’s Pride Festival, an annual event in downtown Toronto during the last week of June and one of the premier arts and cultural festivals in Canada. It is also one of the largest Pride celebrations in the world with an estimated attendance of over one million people. It celebrates the history, courage, diversity and future of Toronto's LGBTTIQQ2SA communities. Please visit: http://www.sootoday.com/content/arts/details.asp?c=73557 for sootoday.com article. One of the largest constellation of stars in the night sky, Hydra is also the name of a mythical many headed beast and of a small water animal with incredible regenerative abilities. 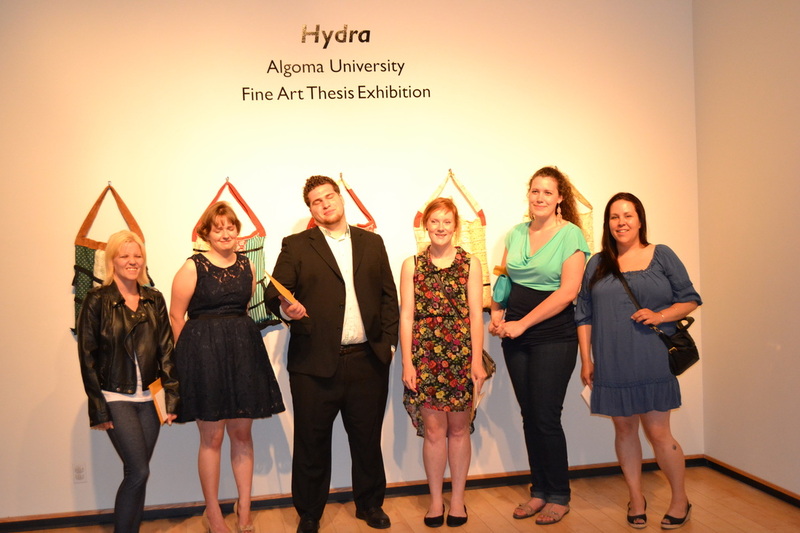 Hydra represents a sampling of work produced by the BFA Thesis students of Algoma University. Throughout the Thesis exhibition course each of the seven artists develop an individually directed body of work. Through countless hours in the studio, thoughtful consideration and critical reflection the artists have taken the seeds of their ideas and transformed them into a series of works or projects that reflect their distinct artistic voices. The individual lines of inquiry and methodologies developed by each artist resulted in a diverse range of mediums engaged: mixed media photo-based paintings and interactive installation, sculpture and immersive installation, soft sculpture, painting and socially engaging projects, painting and found object sculpture, digital painting, video, and printmaking. Amongst these wide ranging approaches there are a variety of shared concerns and evocations such as the repurposing and transformation of previously used materials, ideas of memory, nostalgia and longing, and the magical and mystical. As a culmination of the artists’ studies, the bodies of work created this year display a fearless capacity and incredible dedication from each of the artists to realize their visions. I would like to sincerely thank each of the advisors; Mariah Atatise-Jourdain, Miranda Bouchard, Professor Annie King and Professor Tom O’Flanagan who spent many hours meeting with and assisting the artists. I would also lik to thank the Art Gallery of Algoma for hosting this exhibition. I would like to thank and congratulate each of the seven artists for their hard work, incredible risk taking and artistic integrity.